After chatting with Judy, I went looking for the group in Roder’s office on 1st floor. It was open so I went in and but they weren’t there. I returned to the council meeting and asked Northfield News reporter Suzy Rook if she knew where they were and she said that Roder moved them. I went looking again and found them in a conference room on the second floor. Helen Medin (center in photo on the right) was there with two other women (apologies, I didn’t get their names), each with a Bible. I asked them if they were part of any organized group or church and they said they weren’t, just a group of Christians from different churches who engaged in various prayer activities in the area, and that this effort was aimed at prayer for our local government leaders, especially during council meeting times. They didn’t seem to have a public awareness agenda to this particular activity, hence the praying in private vs. say, in the hallway outside council chambers. Why not pray for our leaders at their own homes or churches or a coffeehouse? They do, but they seemed to think proximity was important, though they didin’t express it that way and I don’t recall the exact wording of their rationale. I asked several times whether they would pray for an outcome on a particular council agenda item and they said no. Their prayers are more along the lines of asking that our leaders open their hearts and minds to God’s wisdom and that our leaders seek strength from God to do the right thing… again, those are my words, but I think that’s pretty close. Helen read me a passage from the Old Testament that referenced leaders and seemed to support this type of praying. I pointed out that it could easily happen that someone show up at their prayer who DID have a council agenda outcome in mind that they wanted to pray for, and that having unsupervised access to the city administrator’s office could be seen as an unfair advantage over those who might be opposed to that outcome. They seemed to agree that, although unlikely, that could happen and that it was fine with them to just meet in a conference room. So unless there’s more I don’t know about, it seems like a judgment error for Roder to let them meet in his office for prayers, especially unsupervised. But I don’t see a problem with them meeting in a public conference room at city hall, as their activity doesn’t seem to meet the ‘attributed to government’ smell test that Judy cited in her statement. It doesn’t seem any different than a group who might meet on Bridge Square to pray for peace. Or am I missing something? I told the three women that I would be blogging about this and invited them to comment. I’ve invited Judy, too. It’s not clear to me whether she had already approached Roder with her concerns about this, or if this was her first attempt to draw attention to the issue. Aug. 7, 12:10 PM update: I asked for Judy to email the text of her presentation and she just did. I’ve put it here in the extended entry. 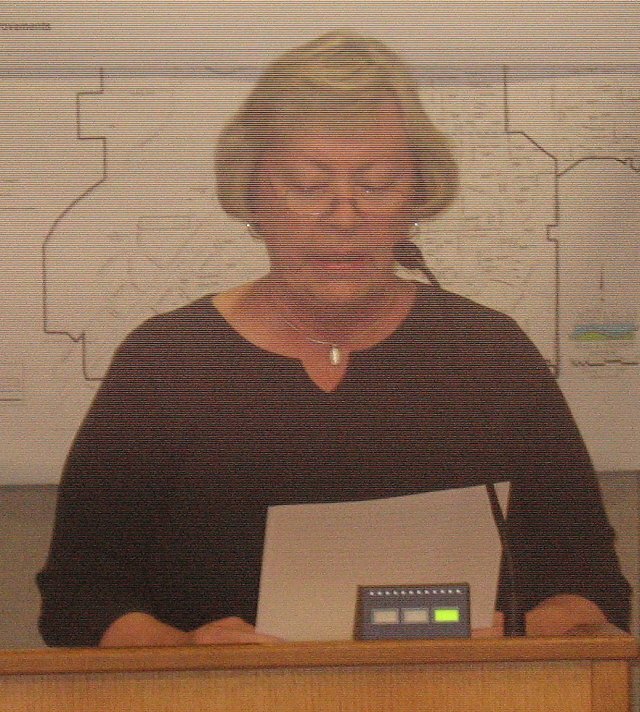 Aug. 8, 12:30 AM update: I captured 5 minutes of audio from the NTV rebroadcast of the end of last night’s City Council meeting where City Administrator Al Roder addresses the Council about Judy Dirks’ remarks. Click play to listen. Mayor Lansing’s voice is heard initially for a few seconds, then Roder. At the 2:40 mark, Councilor Noah Cashman begins his critical remarks of Dirks, with Scott Davis voicing support for Cashman’s comments right at the very end. My name is Judith Dirks. I live at 715 Highland Avenue. Although I Chair the Northfield Human Rights Commission, I am not here in that capacity this evening; I am here to speak solely as a resident of Northfield about a matter that concerns me. Over the past few months I have become aware of a prayer group that meets in City Administrator Al Roder’s office during many of the City Council meetings. I have been told that they are there to pray for Northfield during the Council meetings. A Councilman confirmed this to me. I personally have observed members of this prayer group going into Mr. Roder’s office, staying approximately 1½ hours, or sometimes longer, then coming out and leaving the building. It deeply disturbs me that people who are not employed by the City are in Mr. Roder’s office while he is not present. They have unsupervised access to anything in his office including files, his computer, papers on his desk … and so forth. What is currently happening in Mr. Roder’s office appears to me to be an opportunity of access, and an opportunity not afforded other members of this community. It concerns me that a specific religious group may be exerting undue influence on a city official to their benefit. It also deeply disturbs me that this it not public knowledge for all of the residents of Northfield. It appears that this is deliberately being kept a secret and I wonder why? I have discussed this with several Northfield residents. Virtually everyone has expressed concern about “separation of church and state” as law in the U.S. Constitution. They are as concerned as I am that this is happening in a City government building and office. In researching this issue, I found a law review article from the Florida State University Law School that is also in a Minnesota Law Review. It states in part (and I quote) “For almost forty years the Supreme Court has limited the extent to which religious expression can take place on public property or in other circumstances in which the religious expression may be attributed to the government.” I have a copy of this document, which I will leave with Attorney Swanson. Are you Council members all aware that this practice is taking place here, and do you feel the public has a right to know that this practice is taking place during Council meetings? As individuals who are elected to represent all citizens of this community, your willingness to allow favored status to a select group of individuals conflicts with the oath you took upon accepting your elected position to this Council. By far the most distressing, however, is the covert manner in which this activity takes place in City Administrator Roder’s office while he is not there. I don’t care if this has been just a couple of times or dozens of times, it is not appropriate. I would ask that the practice stop until a review of this practice can be held and a public discussion conducted. 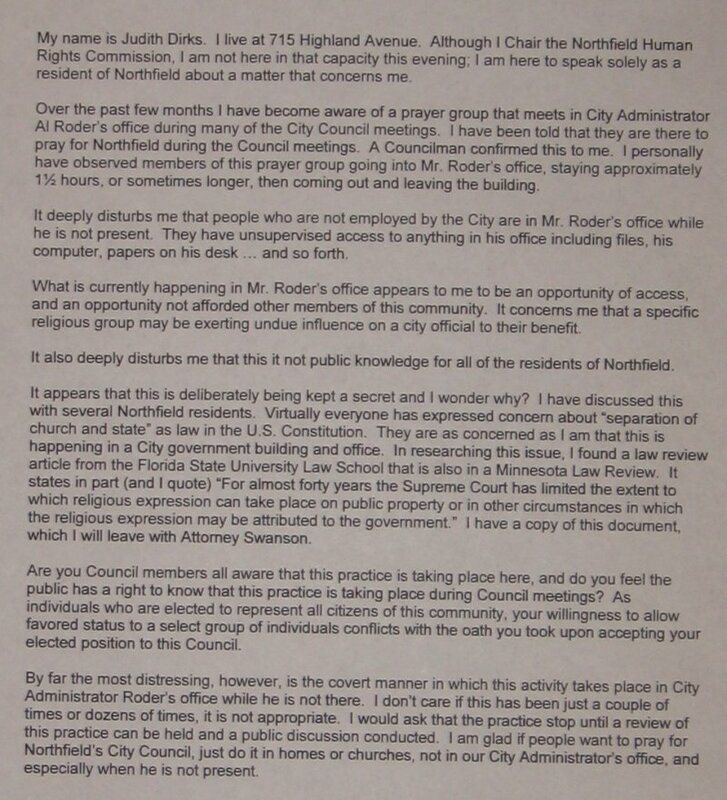 I am glad if people want to pray for Northfield’s City Council, just do it in homes or churches, not in our City Administrator’s office, and especially when he is not present. Councilor Scott Davis, could you comment here? Councilor Scott Davis, don’t comment here. Can-o-worms! While I’d appreciate comments in response to the Charter “rebuke” – If I were on the council I’d not comment on this blog. Perhaps on my blog or to the Newspaper’s request… but best… at the council, from the dais. Victor, you have a blog? Where? so I don’t see why he shouldn’t comment here. On our podcast yesterday, Councilor Scott Davis discussed Judy Dirks’ and the council’s handling of the ‘prayer’ issue. It starts at the 18:45 mark.